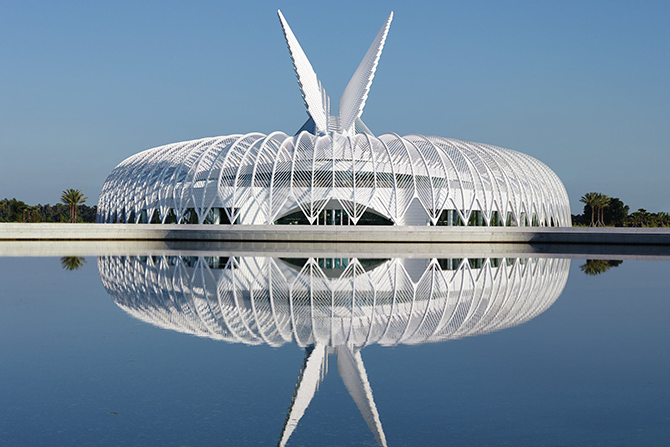 The Florida Polytechnic University, located in Lakeland, Florida, is the first science, technology, engineering and math (STEM) university in Florida (which features 11 other public state universities). The Innovation, Science and Technology (IST) building at the very center of it all was named one of the 16 “MOST BREATHTAKING” BUILDINGS in the world in 2016. Aptly named, the IST is a visual representation of Florida Poly's core values in innovation, science and technology, featuring vaulted ceilings, bright open spaces, eco-friendly outdoor pergolas providing shade to the first floor Arcade and second floor terraces, rotating to diffuse 60 percent of the sun and reducing solar heat gain. Geography and weather conditions in Lakeland played a considerable part in the building's design. Temperatures average a balmy 82 degrees throughout the year in Central Florida, and range between mid-to-upper 90s over the summer. This drove a need for lightweight yet efficient building materials that could stand up to the local temperatures. In addition, the area's significant rain and hurricane season resulted in the need for durable construction that could stand up to hurricane-force winds.